“Captain Marvel was, in his prime, Superman’s worst nightmare. Published by Fawcett comics during the “Golden Age” of the forties, Marvel often out-sold the Man of Steel. It would take slumping sales and DC’s lawyers to eventually put the Big Red Cheese into retirement in the 1950’s. In the early Seventies, the same DC that shut him down decided to prop the Captain back up and give him his own title. 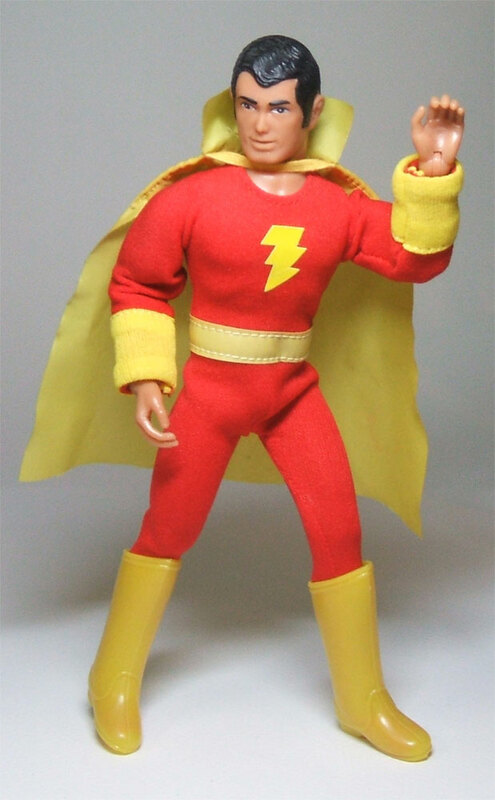 With his newly dubbed “Shazam!” comic and later filmation TV series the Captain experienced a revival in popularity. 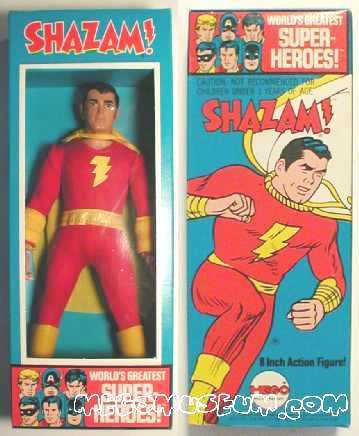 This made him a logical choice for Mego in fact, Shazam! 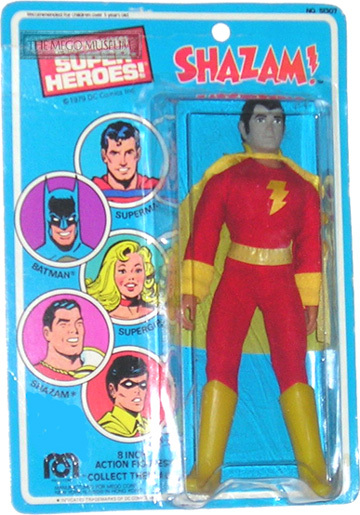 was the only male hero added to the 1974 Mego Catalog. Mego would later add a figure of his Filmation TV Co-Star Isis. Captain look like a real person. We can forgive the off model yellow cape, a white cape would have gotten dirty before we got home from the store. The Captain Marvel box features art that looks to be taken from the great CC Beck. Shazam was released on a Kresge card, but it’s impossibly rare. Only a few examples exist and we have yet to feature a photograph here. 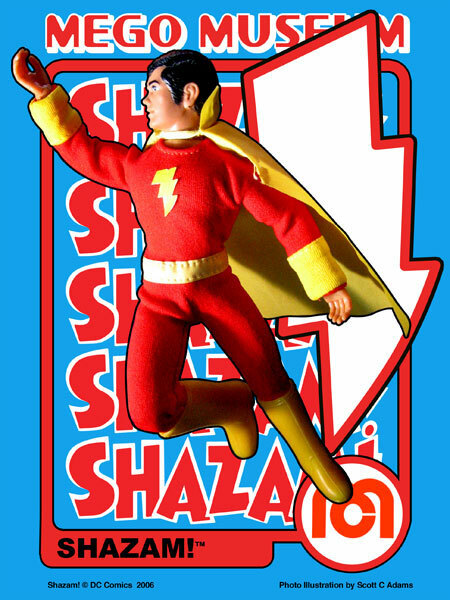 1976 Carded Shazam, notice that he was one of the characters that appeared on the front of the card. Shazam was released on a Kresge card, it remains the most difficult to find specimen ever. 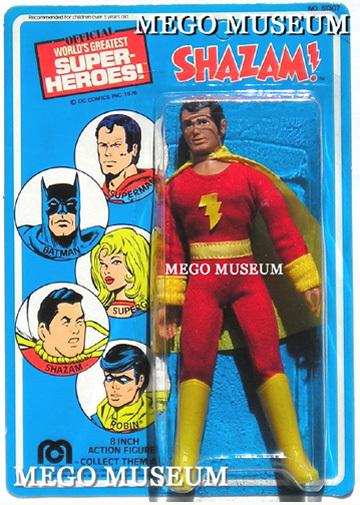 many late produced Mego figures. 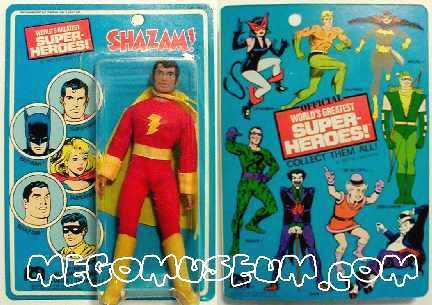 Mego Shazam as produced by Mexico’s Lili Ledy, a very hard to find figure and impossible to find in the box. Pic courtesy of Foreign Mego. There are a lot of high quality home made paper and cloth emblems out there, but Doctor Mego’s are the only factory made version. His is a paper die cut emblem and actually looks much cleaner than the original paper version, which can look a little white around the edges. Doc’s has a dimpled texture. 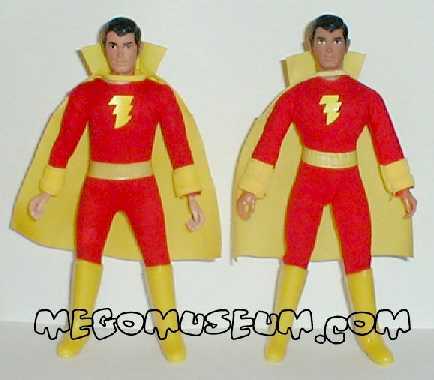 Doc Mego’s is the only factory made cape in town when it comes to Shazam, and is very accurate in design, although the color is a little brighter yellow than the average loose Shazam cape. DM is printed on the inside back near the collar. Both DM and CTVT have made boots. 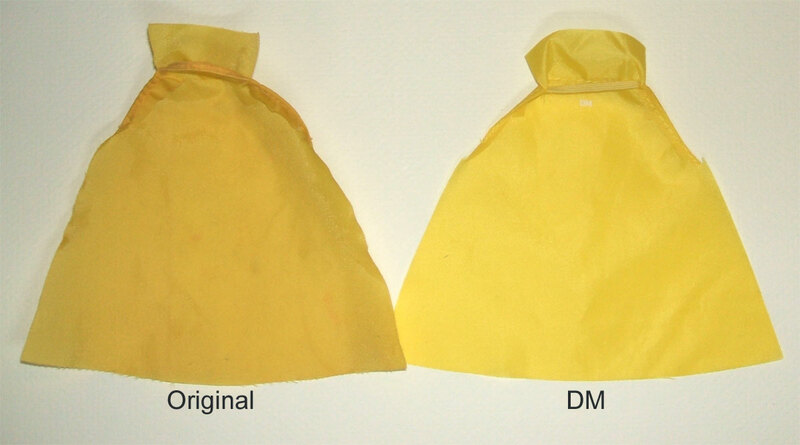 DM’s are more bright in color with thicker plastic, more round around the edges and stamped DM on the bottom. CTVT’s are closer in color and thickness, but are more transparent. They are unmarked. Doc Mego makes a Peter Parker head, which is a character who shares a sculpt with Shazam. The biggest difference is the overall shape of the head. 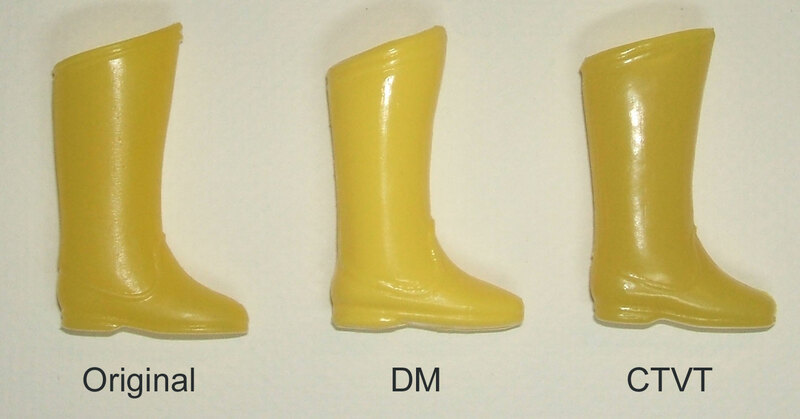 DM’s is more narrow at the chin than an original and made of a firmer material. The eyes are painted blue like the Parker version. It is marked DM on the back of the neck. The original Parker head has a little different paint job around the hair and the eyes are blue. The original Parker head has no markings on the back of the neck. 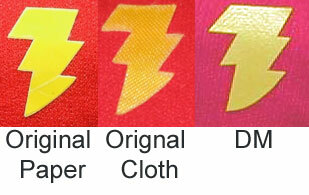 The original Shazam head is stamped with the DC NPP copyright info on the back of the neck.